Spar Carols by Candlelight is looking for a school choir to be the opening act at our carols event. 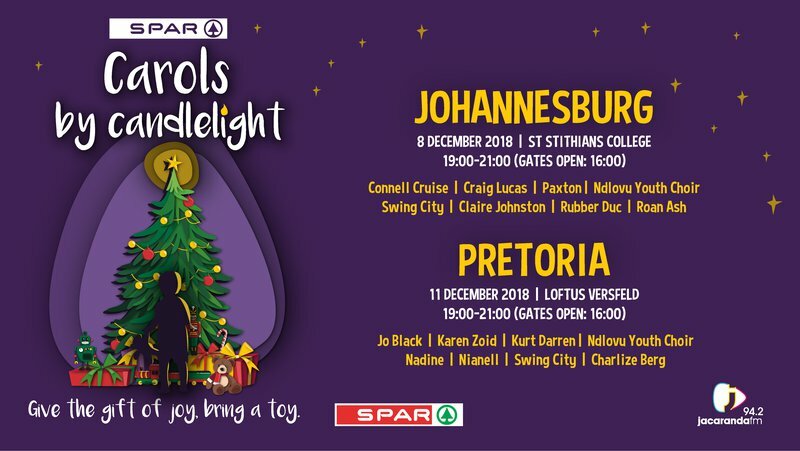 Connell Cruise, Craig Lucas, Paxton, Swing City, Claire Johnston, Rubber Duc, Roan Ash, Charlize Berg, Karen Zoid, Kurt Darren, Nadine, Nianell and Jo Black at the SPAR Carols by Candlelight with Jacaranda FM in Johannesburg or Pretoria on the 8th or 11th of December. Upload a video of your school choir to the Jacaranda FM website and you could be joining us on stage! Winning Schools will be announced 04th December 2018 on Breakfast with Martin Bester.